VOGONS • View topic - What's the Chance That an IDE Port Mysteriously Gets Damaged? What's the Chance That an IDE Port Mysteriously Gets Damaged? A few days ago, I noticed that when I tried to turn on my Pentium 3 machine (https://www.vogons.org/viewtopic.php?f=25&t=56714), it would start to turn on, then immediately shutdown before it even reached the GPU's BIOS screen, before POST. I tried replacing the PSU and the CMOS battery. Neither worked. So, I then proceeded to remove the board from the case and start with the essentials. Thankfully, the board posted with the CPU, RAM, and the Voodoo3 installed. I then proceeded to reinstall the board into the PC case and install and test each add-in card one by one. No problems. I then reconnected the front I/O panel, floppy drive ribbon cable, and IDE cable, and that's when the PC stopped POSTing like it did before. Some trial-and-error later, it turns out that the Primary IDE port on the motherboard is to blame. Whenever I have something connected to the "slave" connector on an IDE cable which is plugged into that Primary IDE port on the motherboard, the PC will refuse to POST. I also noted that if I go to connect the IDE cable to such a "slave" device (such as the optical drive in the system) when the PSU is "on", it will actually turn on the motherboard as if I pressed the power button (I only observed this once, though, as I didn't want to do this again ). However, the port is okay if something is attached to the IDE cable as a "master", and only as a "master". I cannot have both a "master" and "slave" drive attached to an IDE cable connected to the port, or else the same behavior would exist. From what I can tell, either the port was somehow damaged (how, I have no realistic clue; I mean, that night or the night before, there was a lightening storm, but my apartment was not "hit", and all of my PCs, including this one, as well as all of my monitors are connected to a less-than-a-year's-old CyberPower CP1000PFCLCD PFC Sinewave 600W UPS, specifically to the "battery+surge" ports on it, so I doubt that was the cause of the problem) or there's a short on the board (although I'm pretty sure there's nothing shorting anything on the port itself; I haven't re-removed the board and looked at where the IDE port is soldering on, but I have blasted that area with compressed air; before I re-installed the motherboard, I was sure to dust the entire case, especially where the motherboard sits, too). Thankfully, the Secondary IDE port display no such problems, so I can use that still. But, this raises my question. What is the chance that an IDE port can mysteriously get damaged? I mean, could it just be the age of the board showing, or is there another potential cause as to this problem, and is there a solution to this "malfunction"? Re: What's the Chance That an IDE Port Mysteriously Gets Damaged? Your trial and error log does not include booting with just the Hard Drive connected as Primary Slave, try this. If this boots, then the port is not damaged. Have you tried replacing the PSU? It could very well be that the PSU may be degrading and reached the point where there is no more enough juice on the 12V rail to power the CD-ROM, and when the IDE controller tries to access it, it causes a POST error. I had a similar thing happen on a P3 with a very old ATX PSU, the PSU no longer could power an HDD and an FDD on the same 12V rail, the FDD started giving me very strange read errors. You are correct appiah4 regarding my trial-and-error attempts. I haven't tried that. I'll try it later and report back. However, regarding the PSU, well, yes. What I had in there before was (by now) a nearly-a-year-old EVGA 430W 80+ Plus White PSU (because I built this system exactly almost a year ago; that was the original PSU I bought for it). When I took it out of the system, I attached a PSU tester to it, and it ran fine for over 20 minutes (not the end-all-be-all test for a PSU, but an okay one for getting a basic understanding as to the health of a PSU, to my understanding). 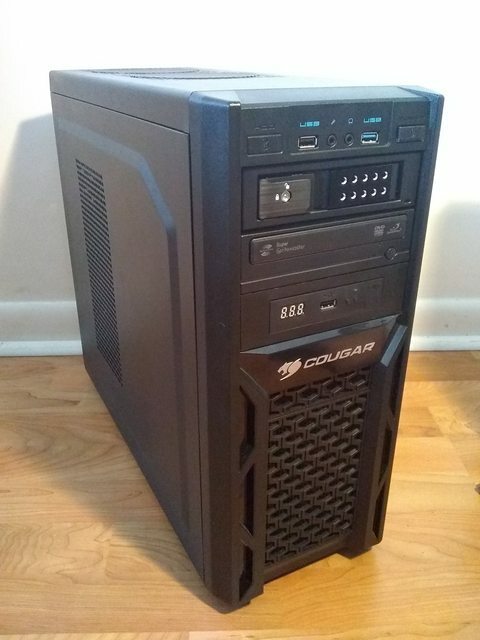 Because I had originally thought it was a PSU problem, I replaced it with a brand-new Corsair CX450 450W 80+ Plus Bronze Modular PSU (https://www.corsair.com/us/en/Power/cxm-series-2015-config/p/CP-9020101-NA). However. that had no effect on the problem. This makes me believe that one, it's not a PSU problem, and therefore two, that EVGA PSU should be okay, to my knowledge. Oh, I also forgot to mention that I tested with two different IDE cables (the one in the system and another one in my collection) as well as two optical drives (the one in the system as well as the first optical drive I had installed in the system before I replaced it with the current Toshiba-Samsung one because of the noise it made, a Lite-On optical drive). How did you get on testing with only the primary slave? Suppose it could be a short somewhere to the primary IDE header, being triggered by the presence of the slave drive (your almost instant on/off cycle & power on when plugging the slave into a 'live' setup). Otherwise master / slave conflicts are mainly just POST hangs, slow boots or unrecognised drives. I'd remove the board and check for solder joint problems (fractures or less likely, creep) and give the general area a good contact clean. Hopefully, it's not a trace failure. *sigh* I guess I'm going to pull the mobo out again. I'll get to it. Thankfully, I bought a nice little soldering kit recently, and it comes with a multimeter, so I should be able to conduct the tests you are mentioning PC Hoarder Patrol. I hope indeed it's not a "trace failure" - that would really bum me out. Sorry for having not responded in like a week. I just got the motivation today to take apart again my P3 system and work on it. I took a few Q-tips and some 91% isopropyl alcohol and cleaned-up the back of the board where I thought I saw residue. While there was nothing on the IDE pins or anything, the Q-tips picked up some dirt/dust/brown stuff off the motherboard (although I wonder if it's just some of the material of the motherboard, 'cause the motherboard is a brownish color; probably not). Any who, this did nothing. I tried what you suggested PC Hoarder Patrol, but from what I could tell, there were no shorts that I could find when I had one multimeter's probe on one of the pins and the other probe touching the solder joints on the back of the board. I then decided to test out "master" and "cable-select mode" on my IDE optical drive, and this is where things get interesting. When the drive was configured as "master", it POSTed, and then, when I set it to "cable select" and hooked it up like a "slave" drive, it also POSTed. This told me that it could not have been a short, because then why did a "cable select" drive work when a "slave" didn't? Sure enough, this entire time, ever since I built this PC like almost a year ago, I have had my "master" HDD connected to the "slave" end of the IDE cable, and the "slave" optical drive connected to the "master" end of the IDE cable. Yes, it does say it doesn't matter really which way you have the drives connected to the IDE cable, but still. Well, it's not like setting it up "correctly" solves the problem, though. I tried both the optical drive and an SATA SSD with a StarTech SATA-to-IDE converter both as "slaves" hooked up to either end of the IDE cable by themselves, and also I had setup them up in the "proper" master/slave setup, and in any configuration the system refuses to post, and in the case of the later, refuses to turn on. However, when I use the Secondary IDE port on the motherboard, all works just fine. I had set both drives to "cable select" and "properly" set them up, as well as set them up as master/slave and connected them to the IDE cable as I have done beforehand, and in both cases the motherboard POSTed and the drives were correctly connected. With all of this in mind, does anyone have any ideas? I have a strange feeling this is not physical and instead software-related problem, i.e. dealing with the BIOS. Any suggestions? Not sure I'm clear, when you say "...hooked up to either end of the IDE cable..."
Do the cables you're using look anything like this, and are you now connecting them only as marked. Can you post an image of any cables you've tried. If the machine refuses to post or turn on when hooked up certain ways it is absolutely a hardware or physical issue. If you are using cables like the above picture the blue end must be plugged into the motherboard. If you are using a 80 conductor cable remove it and try plain old 40 conductor, I have seen systems do weird things with 80 conductor cables when they weren’t designed to use them. Using a BX board, ATA 33 is the max speed so no need for the 80 conductor anyway ( needed for ATA 66+). Sorry, PC Hoarder, that was a poor choice of words. When I meant "...hooked up to either end of the IDE cable...", I meant hooked up to either the "grey/white/black slave" terminator on the IDE or the "black master" terminator on the IDE cable, as shown in your picture. And yes, gbeirn, I assure you that I do indeed plug the right end of the IDE cable into the motherboard: I just had plugged the IDE drives into the wrong part of the IDE cable. I figured as much but it's always worth checking just in case (and if I'd looked at your Flickr album first I'd have seen that for myself, Doh!). - you can set up any suitable IDE cable with the sata HDD / SSD as master (using the jumper on the IDE2SAT board) and the optical as slave (using the jumper on the drive) which works on the secondary IDE header but not the primary header. This would also be true if you set both devices to Cable Select - secondary works but primary doesn't. Yeah, that's the situation alright. So, do you think it could in fact be trace damage PC Hoarder? I mean, when I took a look at where the IDE ports were soldered onto the board, all looked just fine. I saw nothing that would raise my attention. And in regards to your suggestion, yeah, that would work, although that would require a second IDE cable, and that would just be a cable-management nightmare, if it wasn't already. Also, are there any games/applications that specifically look for a primary master HDD, and if they can't fine one, refuse to work? If so, then by all means, I'll add another IDE cable into the mix. Suppose it could be trace or controller failure (connected to the storm or not?) though it'd be harder to diagnose. My only other random suggestion would be to try testing without the SATA drive & adapter in the chain, using any old native IDE you have to hand on master and the optical on slave. Can't argue re. cable management (as someone who spends hours on it when building!!!) though you could look at some of the items here as a possible solution. I'd have thought most games/apps that are checking would be more interested in there being a drive C: rather than what header it's hanging off. Damn, those cables are hella cheap. I'll pick some up latter if need be. I might try your suggestion with an IDE hard drive (I actually just acquired one from my older brother's very old Dell PC), but that'll be for another day. I just installed a StarTech 5.25" 3.5" SATA drive bay into the system, and hooked both the IDE optical drive and the SATA hard drive (via StarTech SATA/IDE adapter) to the Secondary IDE port, and all works well. I ran into no issues while playing NFS3: Modern Patch in Win98SE or Doom+Doom2 in MS-DOS mode. It's sad though that my Primary IDE port had to "fail" like it did. Now, I have another question. After I upgraded from a P3 600E to an P3 800E nearly a month ago, I had let the PC run for I guess a few hours total until I realized that I had to change the switches on the motherboard to account for the faster CPU (the switches I believe control the multiplier, so the motherboard was set up to say to the CPU to "run at 6x multiplier" when I should have set the switches so that the motherboard would say "run at 8x multiplier" (the multiplier needed for the CPU)). However, I resolved that error shortly after the upgrade, at least a week or two before the "failure" of my Primary IDE port. Do you think PC Hoarder that this mistake could have had a hand in causing the problem I'm facing?